Animal Jam lets users step into a wonderful, colourful, creative and fun world of adventure where players can explore a huge game filled with features and facts about the animal kingdom and real-world conservation efforts. Collaboratively designed alongside National Geographic the game educates as well as entertains and is geared towards a younger child audience with the colourful graphics and security measures in place to protect vulnerable minors. 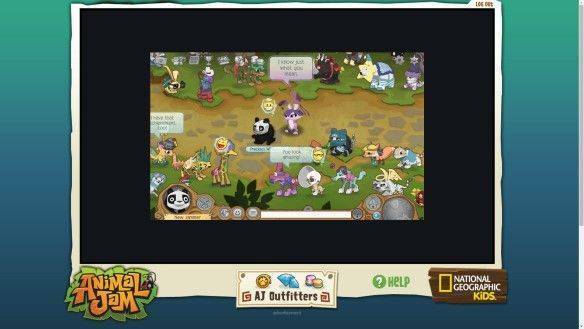 Animal Jam can be played for free, with a parent approval subscription option to turn a free to play account into a Member account and granting it extra privileges in game. The game can be accessed in your preferred Internet browser and players do not need to download a client in order to play. The game primarily revolves around players creating their own “Jammer”, a cute and cuddly animal avatar that will represent them in the interactive online world where they will meet other players that they can chat to, play games with and explore the world. Customisation is extremely important and players can choose from a list of different animals to represent their character, from koala bears, tigers, seals, penguins, rabbits, pandas, wolves and monkeys; users can also change the colour of their animals and give them funky fur patterns to add to their uniqueness. There is a wealth of features to discover in the game, made to educate and entertain they range from a variety of mini games that players can play for fun and also as a way to earn in game Gems, the free currency used to purchase a variety of items. Such items include virtual pets that will follow their owner around but can also be similarly customised or used to play games with at various places in the world. Players can spend their Gems within the games shops to buy clothing accessories ranging from hats, glasses, footwear and other items that can be equipped such as candles and swords. As well as characters and pets users also gain their own Den in which they can store all types of items they have found in the game and purchase furniture items and other decor to personalise their own living space. Whilst the game offers a wide variety of entertaining elements for children there are also a number of educational tools that players can access to learn all about the animal kingdom, watching videos of animals in the wild, in conservation enclosures and also talks from respected scientists who are experts in the animal sciences. There are various printable colouring sheets for children as well as printable fact sheets to try and teach children even when they are not playing the game, however all the facts and information that a user may discover throughout their explorations in the game is documented in their own personal Journey Book. Parents can rest easy with their children playing Animal Jam, with a number of security features such as character naming and chat filters, online moderators and an easy to access and simple to use report feature for children to report “Bad Jammers”.